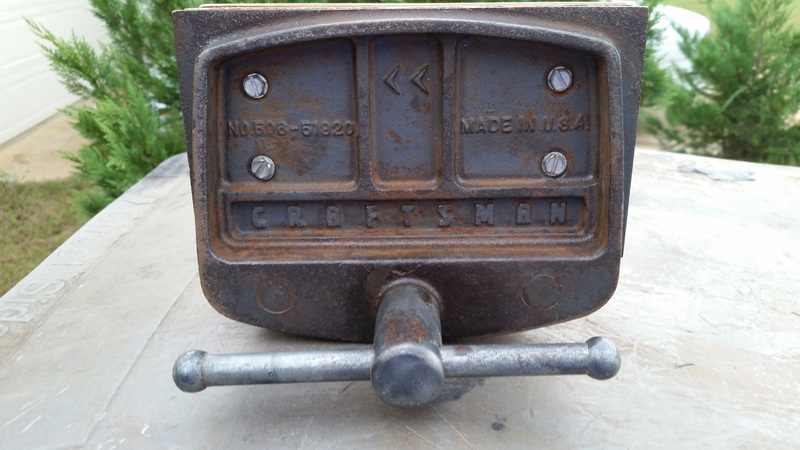 Restored Craftsman 506-51920 Woodworker's Vise, ready for another 40+ years of service. I recently picked up a few tools at an antique mall in Alabama, which included a vintage Craftsman 506-51920 woodworker’s vise. 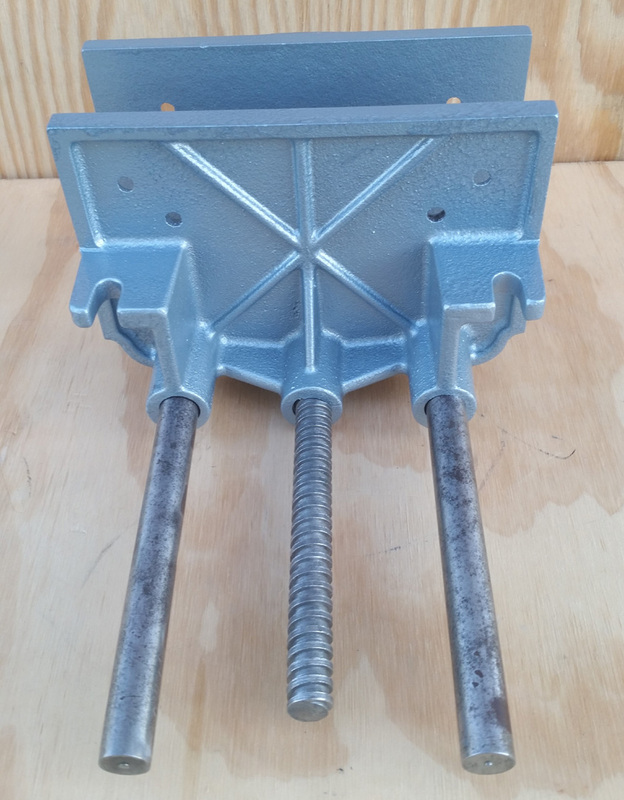 This post will describe my restoration of the vise, which will be put back into use. This vise model started being sold by Sears around 1973, so it’s not much older than 43 years – ‘vintage’, but fairly recent. The jaws are 4×7 inches and open to 7 inches. 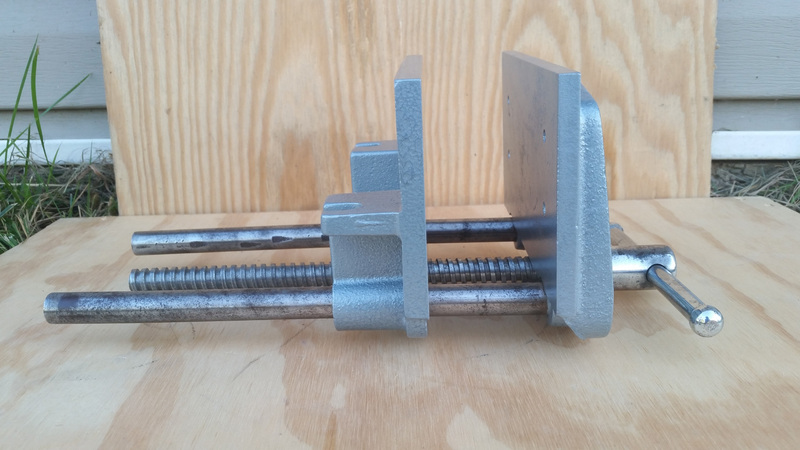 This vise is a non-quick-release vise, unlike it’s big 10-inch brother, the 506-51890, which I previously restored. 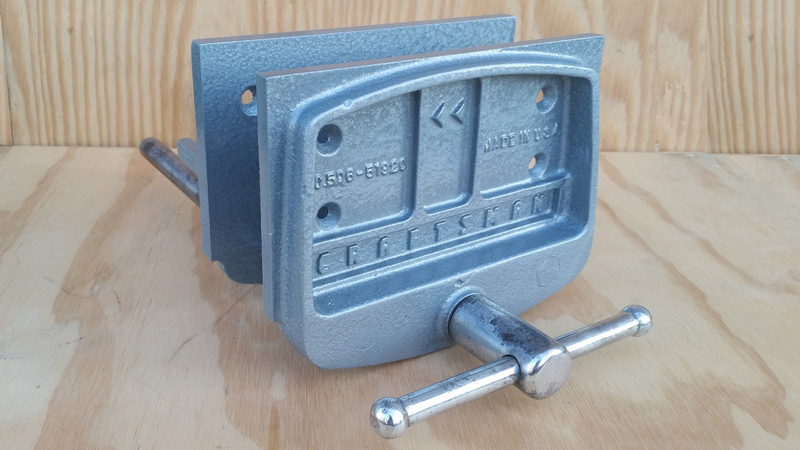 Normally, I’d prefer a heftier quick-release vise, but this one is going to go on a small workbench that I plan to build for my kids to play on, so the 51920 provides the twin benefits of being lighter weight (12 lbs) and more intuitive for a small child to use (a quick-release nut can be a little confusing to little kids – this one just continuous turns to open or close). 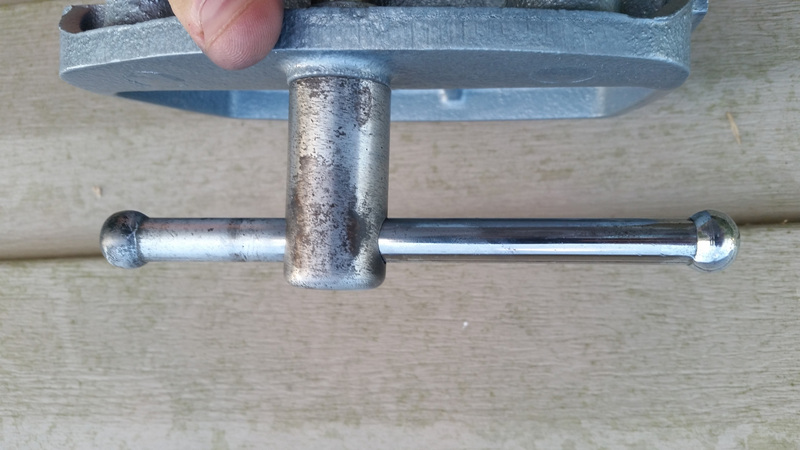 I think I paid $35 for this vise, so it’s not going to make me cry (much) if when the kids abuse the vise. It cost $16.19 from Sears in their 1972-1973 catalog (the earliest I could find it – it wasn’t in the 1968 catalog). In 2016 dollars, that would be $87.07. 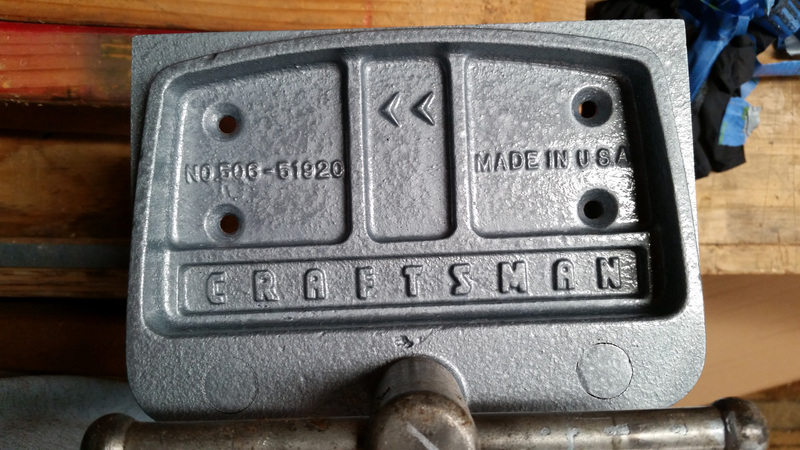 This vise’s 506-prefix indicates it was manufactured for Craftsman by Columbian, in the USA (of course). 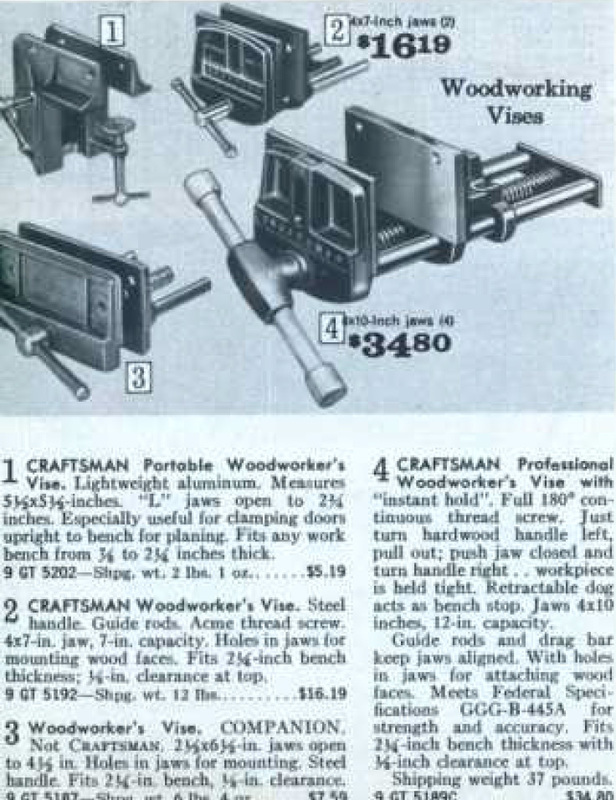 My vise is #2 in the photo from the 1972-1973 Craftsman catalog. Craftsman Woodworker’s Vise. Steel handle. Guide rods. 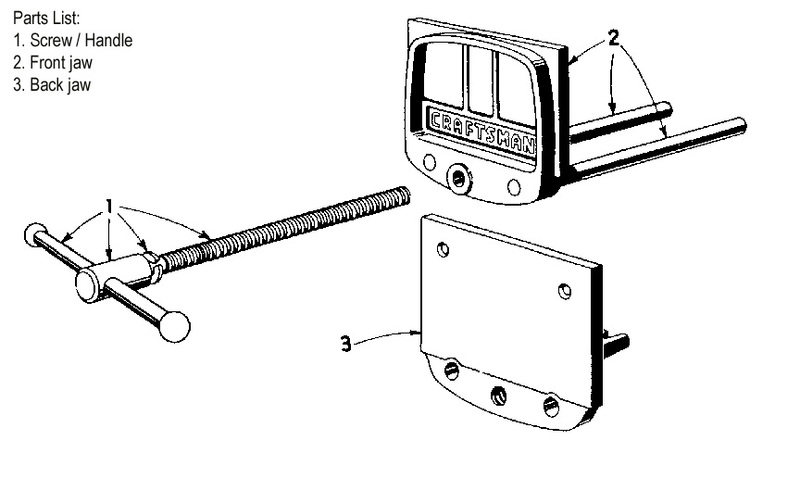 Acme thread screw. 4×7-in. jaw, 7-in. capacity. 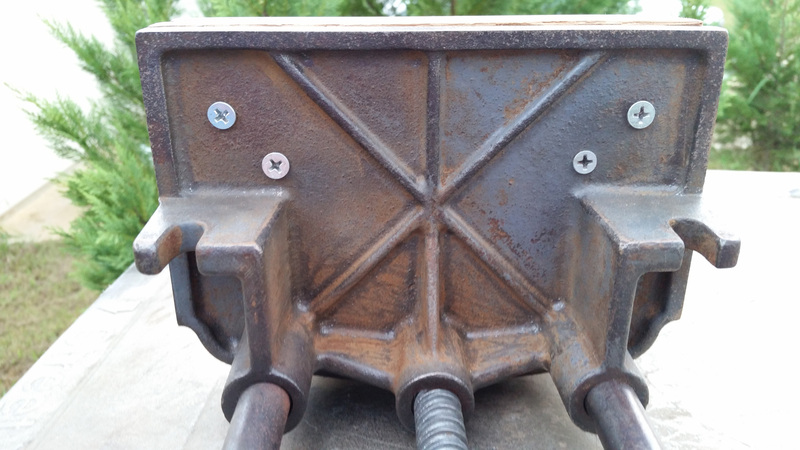 Holes in jaws for mounting wood faces. Fits 2-1/4-inch bench thickness; 1/2-in clearance at top. Shipping weight 12 lbs. $16.19. The front casting looks essentially the same as my 51890, but there is no included dog. One could be retrofitted between the front jaw and the wooden pad if desired. Back of the rear jaw. Note the lack of a drag bar, which would have prevented the front from completely unscrewing. The rear jaw has two ears to attach to the underside of a bench. I inspected everything closely for cracks before purchasing. 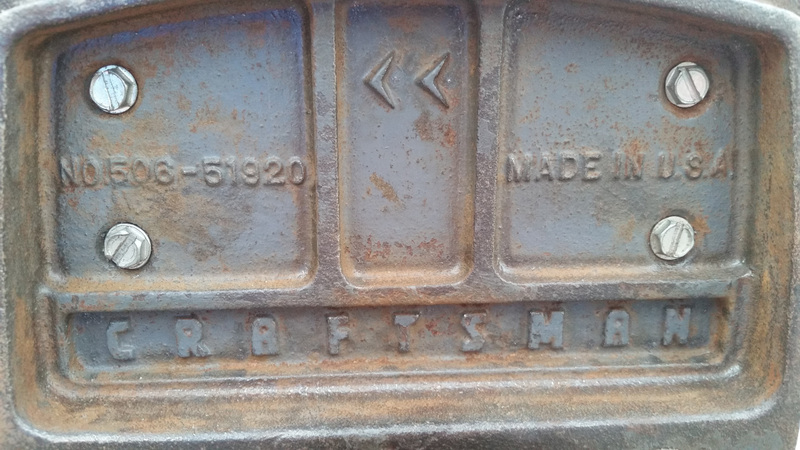 I expect that the ears, the edges along the ears / rear of the back jaw, and guide bar channels are where these cast iron parts will want to crack first. 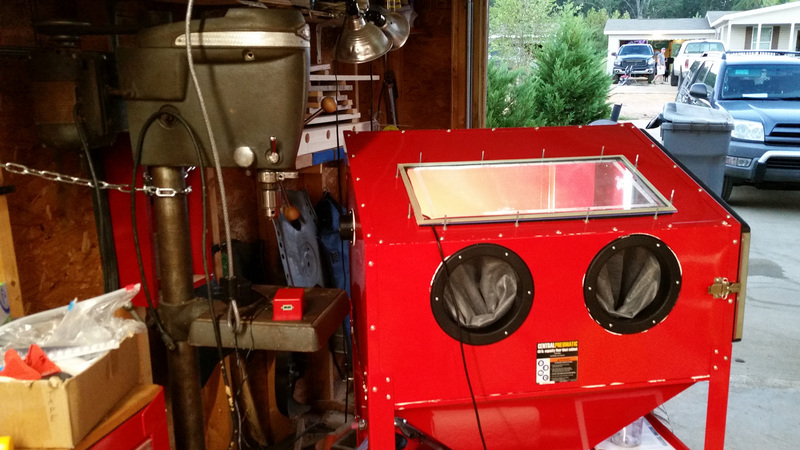 I have wanted a blasting cabinet for a year now. I finally pulled the trigger on this one from Harbor Freight. After heavily modifying it (a potential separate post), I was actually pretty happy with the cabinet. My Craftsman 100 series drill press is waiting her turn in the cabinet. I think she’s a little offended to be sitting next to that foreign-made junk. 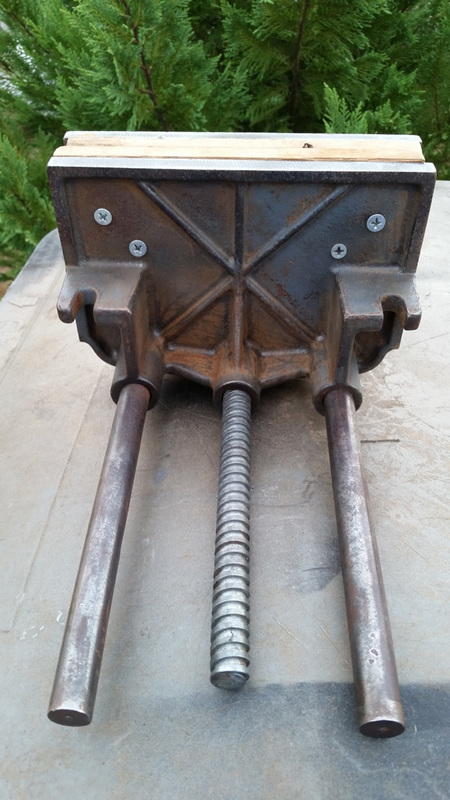 My first blasting project was this vise. I plugged the threaded hole and taped off the handle and bars. They’d get polished later. Sorry, no ‘in-progress’ photos during the blasting. I was pressed for time. 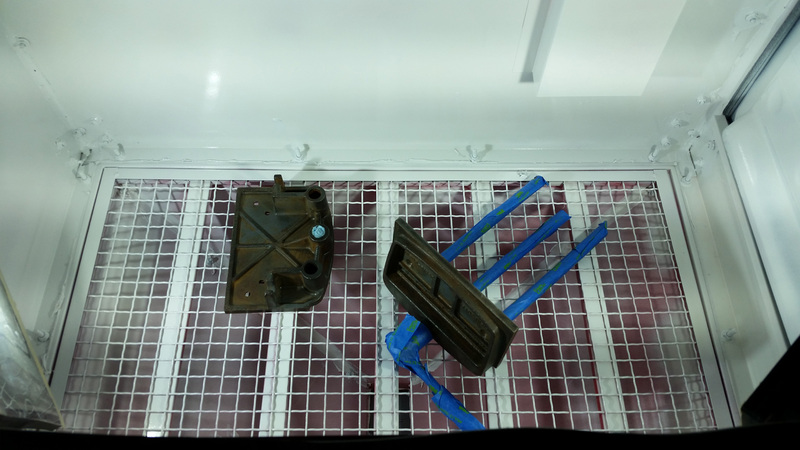 Suffice it to say, everything came right off, and I just blew off the grit, wiped it with acetone, and proceded to paint. I used Rust-oleum Hammered Light Blue, purchased from Amazon. After paint, before polishing the bare steel. I probably should have polished first, but everything is pretty accessible even once painted. I started cleaning up the bare steel parts with 400 and 600 grit sandpaper, then went to a cotton buffing wheel with white buffing compound. I’m not going for perfect, just smooth and rust-free. The right side in the in-progress photo was buffed and the left side hadn’t yet been buffed, so you can compare. I ended up buffing things a little more. After paint and some basic polishing on the handle. Rear view. I still intend to polish the guide bars a little, but they’re almost as smooth as they’re going to get. I think the left hand one got bumped at some point. There’s a slightly snug point during closing. It’s not at all a big deal, and lubrication will probably fix it. 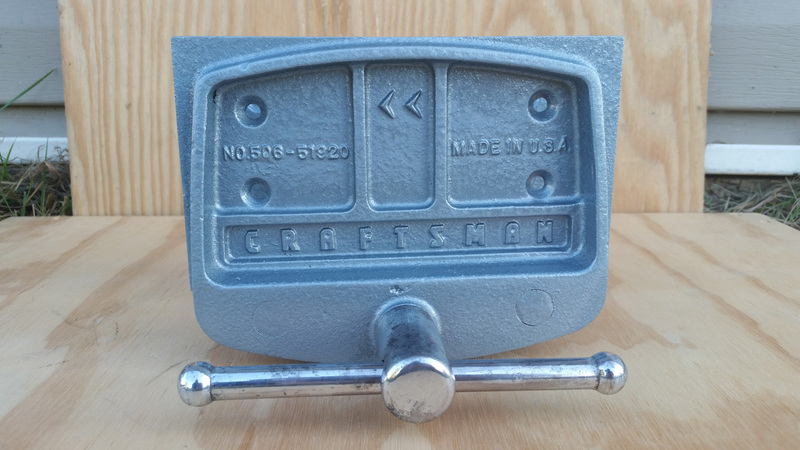 Restored Craftsman 506-51920 Woodworker’s Vise, ready for another 40+ years of service. 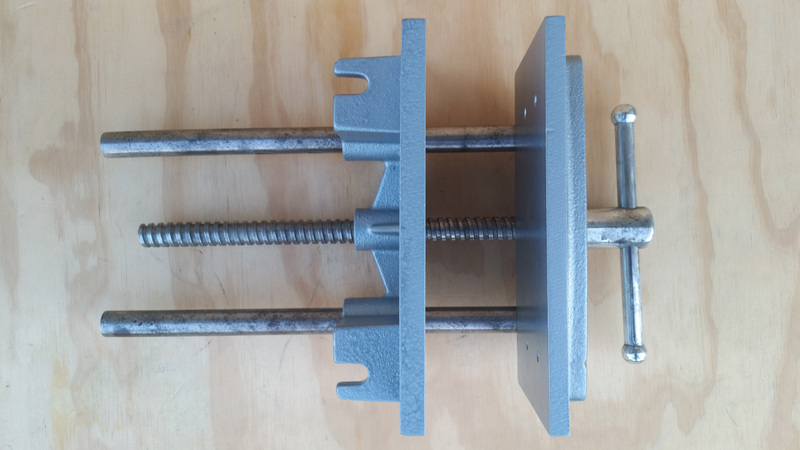 I still need to cut some 3/4-inch plywood jaw pads for the vise and I will locate some better-fitting screws to hold the jaw pads. I might experiment with cold-bluing the screws, just so they don’t stand out as much. Otherwise, the vise is waiting for me to build my kids their little work bench. 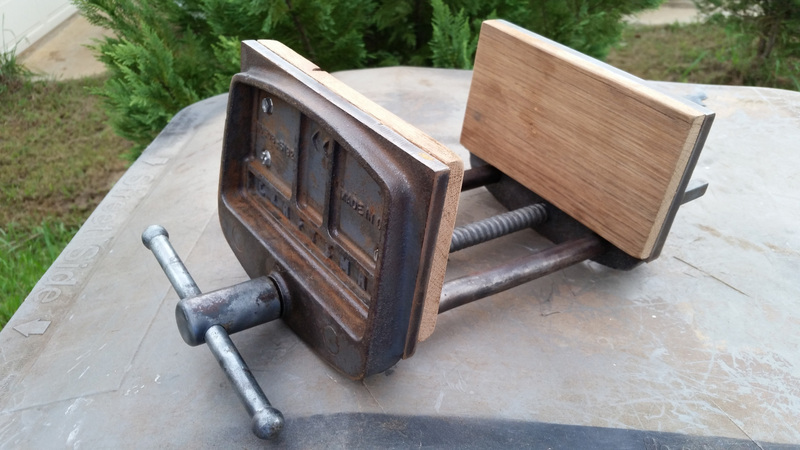 I had fun restoring this little vise. Hope you enjoyed this post!